The large audience for the Cardamom Quartet (Lisa Goddard and Rachel Panitch, violins; violist Gillian Gallagher and cellist Ariel Friedman) on Saturday testified to Medford’s thriving arts scene. Certainly, a confluence of supportive institutions helped to bring this about: the First Baptist Church of Medford, which hosts a varied range of concerts; and the Coalition for Arts, Culture, and a Healthy Economy, who organized the October “Arts Across Medford” festival. The church is a pleasant space, open, resonant and not too large. Like many churches it did not have great sightlines, particularly since the musicians sat at floor level, but it was comfortable. Hildegard of Bingen’s O Lucidissima apostolorum turba served as in invocation. 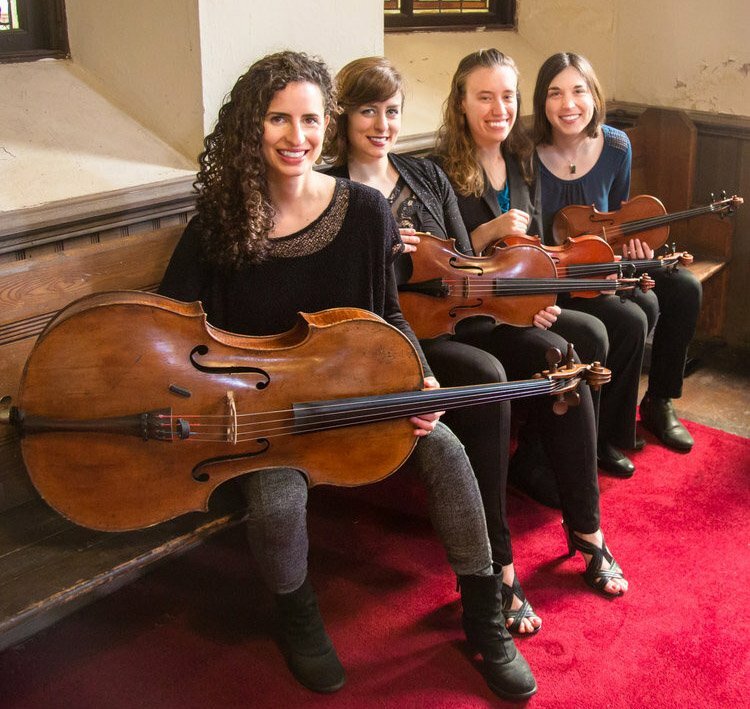 Traditional string quartet programming often places a work by Haydn as an opener, honoring his role as the “Father of the String Quartet.” How fitting, then for Cardamom, now in its second year of programming only music by women, to place Hildegard in the role of the honored forebear. Lisa Goddard’s arrangement aptly turned speech-generated rhythms into an instrumental idiom, and with a varied texture of octaves and unisons highlighted the composer’s propensity for exuberant melodic shapes. The music cast its serene blessing on us through this luminous rendition. The striking opening with its bold upward leaps then eased into the floral murmurings, with hushed echoes coalescing into eerie chordal shadows. It was an effective and atmospheric work. I’ve heard Gabriela Lena Frank’s Milagros (Miracles) performed three times now: first by the Cardamoms about a year and a half ago, and then a few months after that by the Harlem String Quartet. Its richness continues to impress, and the Cardamoms have grown with it. Might Frank be the Bartok of our day, and of our hemisphere? But the resonance of Milagros suggests such hyperbole. She shapes folk-infused ideas into a modern personal experience. The eight short movements, labeled “Milagritos” or little miracles, evoke Frank’s experiences in her mother’s native country of Peru. The first, Capilla del Camino (little roadside shrine), a violin solo, offered folk-style―edginess and a brusque but melancholy quality from Rachel Panitch. Then followed “broken panpipes” — haunting parallel chords, and then dramatic pounding rhythms, the vigorous dancing that broke the panpipes. “Mujeres cantando” (singing women) was a wash of shimmering chords, punctuated by outbursts. A range of imagery exciting, ghostly, melancholy, bizarre — are brought to aural life through a vivid palette of string techniques. Then the Capilla del Camino is recalled, this time by violinist Lisa Goddard, with its brusqueness replaced by a weary warmth. In the Andante Moderate from Florence Price’s String Quartet in G Major a lushly harmonized melody (suggesting a traditional Spiritual) framed a buoyant scherzo section. You can hear the heart-melting sincerity in the quartet’s performance HERE. Composer/violinist Rachel Panitch completed Ambedo just a few months ago. The title is a term created by author John Koenig, in his Dictionary of Obscure Sorrows, meaning “a kind of melancholic trance in which you become completely absorbed in vivid sensory details.” Thus we (briefly) fixated on swirls and swoops, and short fragments circling as ostinati. It was fascinating and bracing. Dorothy Rudd Moore, a composer whom I had previously I had known only from Helen Walker Hill’s “From Spirituals to Symphonies,” was a wonderful discovery for me and for the enthusiastic audience. Moore wrote that she determined to become a composer, despite only know composers who were “male, white and dead.” In her three-movement string quartet Modes, the first two were intensely contrapuntal, making the composer’s two named influences readily apparent―Ellington in the modal melodic flavor, and Bach in the texture. The first movement sounded rather moody and pensive, the second, intensely and deeply poignant. The exuberant last movement energized with syncopated drive. Altogether, the Cardamom Quartet gave compelling and engaging interpretations of this varied and important repertoire.